We all have our own brand of filters we see through. What is yours? 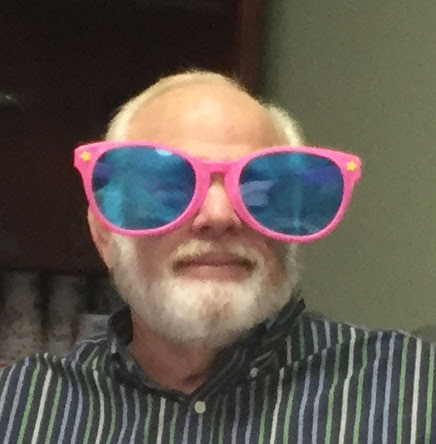 I have in my office a very, very large pair of sunglasses. They are used to illustrate the filter we all look through. As I teach Paul’s first prayer Eph 1:16-20, I use them to make a point. Just like Paul I need to be blinded by the LIGHT and knocked off my horse before I can see the revelation of HIMSELF. (that happened many years ago) Much has changed. I am learning to continue to consciously remove the filter and see the continuing revelation of HIM. Spend a few minutes in taking a different look at Paul’s first prayer for those believers in Ephesus. Be open to receiving his prayer for yourself. Wisdom, revelation and enlightenment may mean we are in for a paradigm shift. What is a Paradigm shift? ”The term paradigm shift was introduced by Thomas Kuhn in his highly influential landmark book, The Structure of Scientific Revolutions. Kuhn shows how almost every significant break-through in the field of scientific endeavor is first a break with tradition, with old ways of thinking, with old paradigms. For Ptolemy, the great Egyptian astronomer, the earth was the center of the universe. But Copernicus created a paradigm shift, and a great deal of resistance and persecution as well, by placing the sun at the center. Suddenly, everything took on a different interpretation … Whether they are instantaneous or developmental, paradigm shifts move us from one way of seeing the world to another. And those shifts create powerful change… The more aware we are of our basic paradigms, maps, or assumptions, and the extent to which we have been influenced by our experience the more we can take responsibility for those paradigms, examine them, (and) test them against reality. . .
Resources for living: self effort shifts to empowerment by the Holy Spirit. (Gal. 3:3). Perception of personal identity: feelings/achievements-based identity shifts to a spiritual /Christ-centered identity (Eph. 2:6,10). Acceptance by God: performance-based acceptance shifts to grace-based acceptance (Eph. 1:6). Work: doing in order to be shifts to being in order to do (Col. 2:6). Self-worth: self-worth based on worldly values shifts to self-worth based on being biblical values–being created in God’s image and redeemed by Christ’s precious blood (Gen. 1:26,27; 1 Pet. 1:18,19). Holiness: The believer is no longer just a ‘sinner saved by grace’, rather a saint who sometimes sins (1 Cor. 1:2; 6:11). Ministry: The believer does not primarily ‘work for the Lord’, but rather cooperates with God through His strength and guidance (Gal. 2:8). Christ’s offices: Christ is not only Savior and Lord, but Savior, Lord, and Life (Rom. 5:10). God’s law as a means of righteous conduct: The believer’s resource for godliness is not primarily an external code of rules, but rather the spiritually prompted, internal principle of the law of love (Rom. 7:5,6; 13:8-10). The Galatians 2:20 paradigm is not grasped by biblical and theological study alone; it is revealed by the illumination of the Holy Spirit. “Now we have received, not the spirit of the world, but the Spirit who is from God, that we might know the things that have been freely given to us by God.” (1 Cor. 2:12). Biblical knowledge is not the same as biblical insight. How the Lord must yean for us to fully appreciate the gracious blessings of life in Christ! Can you say “amen” to Dr. Olford’s discovery? Is your perception of the Christian life humanistic and feelings-based, or biblical and Christ-centered? Let’s dare to believe the Holy Spirit’s witness through the Word of God. He unveils the riches of divine grace, so shift your paradigm by faith! We praise You O God for the full forgiveness we have through the Cross of Christ. Deliver us from our own feeble attempts to gain victory, and shift our perspective to fully appropriate Christ’s saving life. For Jesus’ sake, amen. Stephen Olford, Not I, But Christ, p. 136.
p. s. The illustrative Optical illusions: you -> me, duck -> rabbit, Teach->Learn. This article is revised from the 1998 and 2001 editions. Copyright by John B. Woodward in 2010. Permission is granted to reprint (with credit given) for non-commercial use. Bible quotations are from the New King James Version. Copyright 1982 by Thomas Nelson.